At Caprice, we understand the value of being able to make environmentally savvy choices at your business. Providing a range of sustainable paper products for your employees and customers is a fantastic way to encourage environmental consciousness, which is very important these days. 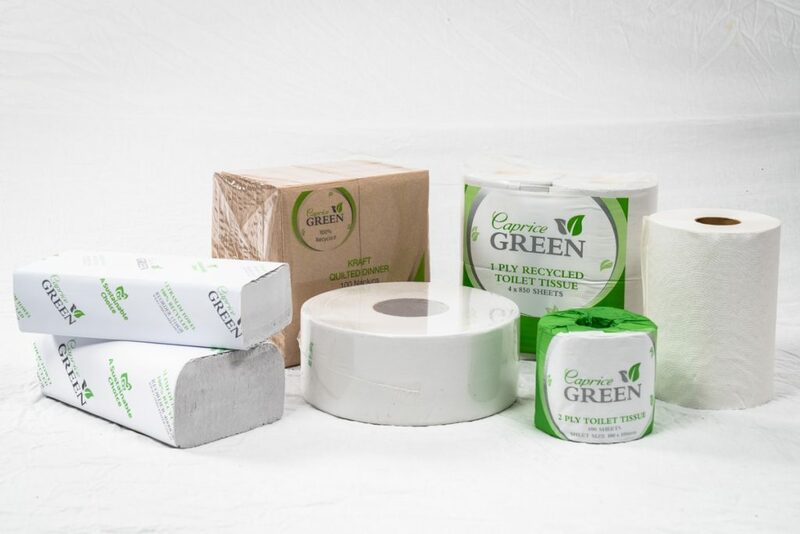 All products in the Caprice Green range are 100 percent recycled, including the varieties of napkins, paper towel and toilet paper. There’s no need for sustainability to be confined to one area of your workplace! The quilted dinner napkins come in natural Kraft to suit every setting, and they’re available in two different folds. If you think they need sprucing up, you can have them custom printed with your business’ logo or design. The paper towel options include interleaved and roll towel varieties, while the toilet paper is available in cartons of individual rolls, 4-packs and, for extra convenience and economy, jumbo rolls. The quality manufacturing of these products ensures they’re both sustainable and dependable. Everything in the Caprice Green range is constructed with absorbency, convenience and the environment in mind. Whether you’re in hospitality, the cleaning industry, or just need to keep your office well-stocked, there’s an easy way to add a collection of wholly recycled paper options to your workplace. Mother Nature mightn’t get around to thanking you personally, but we think you and your customers will be glad you switched to Caprice Green.